Okay, I brought home a stack of books, but . . . . . . . . . I only read one of them and bought a new one and read that too. I guess two books in two weeks is sufficient, but I had planned to spend more time reading. It just wasn't what happened. I spent time visiting with family and friends and watching a lot of movies on television. 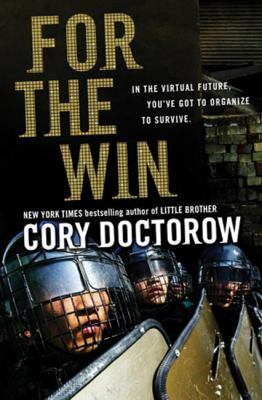 The first book that I read was For the Win by Cory Doctorow. I was intrigued by this book because I liked his Little Brother so much. This book had the technology component but otherwise was very different. There were a zillion characters all living in different parts of the world and each chapter told several stories at one time. All the characters were involved in computer gaming in some way, but the book was also about the economics of labor unions and how all workers could unite for better working conditions. It took me a very long time to follow who was who. I don't know if I am smart enough to understand all the themes that he presented, but by the end I was rooting for the good guys to win. Even though I have a stack of books by the side of my bed; I went out and bought something new. I needed to have a book for my adult book group. Every year around the holidays we select a theme. Each person reads a book of their choosing. Then when book group meets, we bring our book to share with other members of the group. I love this event because so many of the monthly books selected are distasteful to me. For this event, I always read something that I love. The theme this year was to select a book that won a literary award. Since I am a school librarian, I chose a book that won an award presented by YALSA (Young Adult Library Services Assciation). 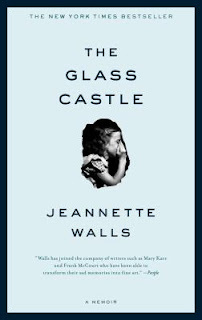 The Glass Castle by Jeannette Walls won an Alex Award for being one of the top ten best adult books for young adults in 2006. It is a memoir about Walls very unusual upbringing. She tells the story from her young self, and I was surprised at the conversations she recreates between her 3 year old self and her parents. I can't remember what happened yesterday much less something that happened 50 years ago. Her childhood was spent on the edge sometimes with no food, no running water or indoor plumbing or heat in the brutal winters of West Virginia. I could not even imagine what that would be like. The story is filled with humor, and even though her parents were nuts, the reader can see their charm. I highly recommend this book. It took me three weeks to get through Doctorow's novel, but I finished Walls' book in three days because I was so captivated by the story.